How can this be? The answer is that these properties are actually caused by collective organizing principles that formally grow out of the microscopic rules but are in a real sense independent of them. – from ‘The middle way’ by R. B. Laughlin, et al, 1999. Emergence and reductionism are two scientific perspectives on causality that have direct bearing on the themes of the bioperipatetic. A scientist’s concept of causality and its associated ontology determine how he will think about the the nature of the phenomena of interest or relevance to his chosen field of science. Of special importance to the bioperipatetic are the sciences of biology and psychology and their respective top-level problems: the problem of life and the problem of consciousness (or mind). The deepest and most important questions are: What is life?, What is mind? and Can they both be reduced to the the properties of matter? Now this whole state of affairs, so well known from the ontogeny of our mental life , seems to me to shed light on the phylogeny of subconscious nervous processes, as in the heart beat, the peristalsis of the bowels, etc. . . . I doubt whether everybody will readily agree with the next step, which consists in extending these notions [of actions of the autonomic nervous systems sometimes becoming conscious when unexpected stress demands it] to other than nervous processes. . . . I suggest as follows: what in the preceding we have said and shown to be a property of nervous processes is a property of organic processes in general, namely to be associated with consciousness inasmuch as they are new. . . . I would summarize my general hypothesis thus: consciousness is associated with the learning of living substance; its knowing how (Können) is unconscious. – from Erwin Schrödinger, ‘Mind and Matter’, Cambridge University Press, 1959., p 9. It has been widely thought that consciousness has no causal efficacy in the physical world. However, this may be not the case. In this paper, we show that a conscious being can distinguish definite perceptions and their quantim superpositions, while a physical measuring system without consciousness cannot distinguish such nonorthogonal quantum states. The possible existence of this distinct quantum physical effect of consciousness may have interesting implications for the science of consciousness. In particular, it suggests that consciousness is not emergent but a fundamental feature of the universe. This may provide a possible quantum basis for panpsychism. – from ‘A quantum physical argument for panpsychism’, Shan Gao, University of Sydney, PhilSci-Archive.pitt.edu, 2013. The bioperipatetic highly recommends ‘Mind and Brain’ for its originality of insights, while also having deep disagreements with its conclusions and its methods. From the perspective of reductionism and emergence theory, the key question is this: Is Schrödinger arguing that consciousness is an emergent property or power of living organisms in general? Or is he, on the other hand, identifying consciousness as a reductionistic principle of organic adaptation and evolution that becomes unconscious as life achieves successful internal and external adaptation? These questions clearly indicate the relevance of the current debate, discussion and elucidation of the concepts of emergence and reductionism. In all sciences, but particularly in the science of biology, there appear many important cases where attempts to understand the system under study through strict and exclusive study of its parts, has proven unproductive. The common phrase, expressing this reductionist failure is: ‘The whole is more than the sum of its parts.’ By this is meant that the whole cannot be either explained nor understood merely in terms of the arrangement and behavior of its parts. More profoundly, the whole cannot be reduced to the structure and laws of its parts. The whole often manifests behavior and even laws that are clearly not reducible to the simple laws of physics that underly its parts. It is from this common set of observations regarding the limitations of reductionism that the concept of emergence has been formulated as a tool for deeper understanding of complex dynamic systems. Emergence theory is contrasted with traditional materialist reductionistic approaches to scientific investigation and theorizing. Emergence is both an ontological and epistemological principle applied to the understanding of complex phenomena that can be clearly shown through scientific analysis to be non-reducible to nor fully or fundamentally understandable in terms of their constituent parts and underlying laws of those parts. The nature of such complex phenomena appears to be based instead on new organizational and relational laws that account for their ontological being and behavior. Given these ontological assumptions underlying emergence theory, the proper epistemological principles must admit the emergence of new levels of order and causality as emerging from their underlying ontological base but not necessarily reducible to that base. This implies that the emergent order is in some sense transcendent of and independent of its underlying pre-emergent structure and dynamism, while at the same time remaining fully lawful with respect to its own nature and identity. In contrast to ontological emergence is the much older and dominant doctrine of materialist reductionism. In its strongest modern Neo-Cartesian, form, materialist reductionism holds that any phenomena in the universe must be causally and structurally derived from the more fundamental material infrastructure upon which it rests. It must be understood as merely an organizational derivative of its infrastructure (or ultrastructure) manifesting no new causal principles or properties or laws that are not themselves reducible to and fully explainable in terms of the underlying laws and order of its foundational material substances. All such substances are simple manifestation of matter and energy (as defined by modern physics). According to this materialist reductionist doctrine, there is nothing else that exists in nature but simple primitive base mater and its primitive laws. There are no metaphysical or transcendent principles or substances, such as élan vital, soul or mind (Descartes’ res cogitans), that supersede or supervene upon the underlying basic materialist physical laws underlying all complex entities and phenomena. According to this doctrine, no non-physicalist, non-materialist ideas about or attributions to the world shall be regarded as scientific. The perspective of the bioperipatetic is that, from a proper, non-doctrinaire, scientific perspective, there is and can be no fundamental conflict between reductionism and emergence as scientific concepts. Reductionism is a methodological perspective based on an a priori assumption regarding the fundamental nature of the physical world, a perspective that argues that all knowable scientific facts are to be guided by and reduced to known (or yet to be discovered) physical laws (as in the laws of physics). Emergence is also a methodological perspective based on a broader assumption regarding the nature of existence extending across the physical, chemical and biological domains. Both reductionism and emergence imply (and sometimes explicitly assert) an underlying ontology, a view of the inherent nature of existent being and the inherent principles and laws active at the very level of being. Thus both reductionism and emergence each have at their base a distinct metaphysics, a set of philosophical premises regarding what it means to exist, or to be a ‘physical’, or more properly put to be a ‘natural’ existent or being. Given the two perspectives or emergence and reduction, the issue, then, concerns when and how to use each of these approaches to the scientific study of nature, separately or in combination, to reach a deeper philosophical, ontological, scientific understanding of nature, and to encourage new fruitful approaches to scientific method, analysis, research and development, and above all scientific knowledge. The conflict between these perspectives and their methodologies is often, in practice at least, between the principle of open scientific investigation and discovery on the one hand, versus doctrinaire science based on a priori, assumptions on the other hand, assumptions regarding how reality must be or ought rightly be conceived. For an excellent paper discussing deeply and dispassionately the history and current state of the theory of emergent properties in philosophy and science, see Emergent Properties by Timothy O’Connor et al. in Stanford Encyclopedia of Philosophy, 2012, and the related page: Notes to Emergent Properties. Materialist reductionism (also called physicalist reductionism) holds that all aggregate phenomena in the physical world (which to the physicist is the entire universe, including all of its existents) can be analyzed down to the local actions (ultimately motions) of their ultimate physical components, presumably consisting of the mechanical actions of atomic and subatomic particles. Aggregation can result in a simple collection or ‘pile’ of the same substance or elemental instances without any integration of its individual elements, such as a pile of sand or a rack of billiard balls. Simple aggregation can be properly characterized as and fully reducible to a mixing together without any chemical interacting of a collection of components. But this is not the case under dispute. What is under dispute is the common reductionist assumption that when aggregation involving chemical, electrical, magnetic or gravitational forces yields physical or chemical (including biochemical) reactions that produce new substances (such as molecules, organs, and systems, which can be immensely complex) (a) that there is no loss or suppression of individual elemental properties or laws in this molecular sum, and (b) that there is no gain or emergence of new properties or laws that are not reducible to the properties and laws of its aggregated elements. Analysis of the whole into its elemental components, will not, according to the materialist reductionist doctrine, lose any important information regarding the nature of the whole. For the whole must be essentially regarded as the mere sum of its parts, both structurally and dynamically. Antireductionists regard this latter position as a species of the error of composition, the unwarranted belief that (1) there is nothing, with respect to properties and lawful behavior in the whole that is not present in, manifested by, and reducible to the simple sum of its parts and (2) that the analysis of the mechanical motions and material properties of the parts is primary, fundamental, and sufficient to the proper understanding of the composite whole. It is possible to demonstrate with a simple inorganic substance, such as water, that its molecules, consisting each of two atoms of hydrogen and one atom of oxygen, can be decomposed into the gaseous forms of these two constitutive elements, and later recomposed through the re-mixture of these elements in their gaseous forms into the original volume of water. But to achieve the decomposition as well as the recomposition requires the external introduction of energy, energy that is not initially present in the system. To accomplish decomposition, for example, electrical energy is introduced to separate the water molecules into their atomic components through a process called ‘electrolysis.’ This causes the atomic elements of the water molecules to be separated from one another by forcing the atoms to assume their ionic forms there their positive and negative electrical states cause them to be attracted to electrically and oppositely charged metallic poles embedded in inverted glass tubes, allowing the ionized atoms to be converted into their gaseous forms and rise into their respective tubes. The result is the disappearance of water and the appearance of separated gases consisting of the original atoms of which the water was composed. To achieve recomposition of the very same hydrogen and oxygen gases into the composite substance of water, the two gases must be remixed in a common container, and then some form of intense thermal energy (such as a small flame or small electrical spark) is required to be introduced into the system. This thermal energy which induces an explosive chemical reaction in the gas mixture of hydrogen and oxygen, which will not, under normal circumstances, chemically, let alone explosively, interact. But what do these two demonstrations prove? That water is composed of molecules each containing two hydrogen atoms and one oxygen atom. That water can be decomposed into its constituent atomic elements and recomposed from those elements. True. At this point reductionism has had its say. However, the missing analysis in our examples is whether the causal principles and properties of water in its liquid form contain only the properties of hydrogen and oxygen in their gaseous forms? Clearly not. The chemical recombination of water from hydrogen and oxygen gases results in a substance whose properties exceed those of mere hydrogen and oxygen in their gaseous forms. Water manifests a liquid cohesion, buoyancy, solvency, molecular polarity and other properties that cannot be manifest by either hydrogen or oxygen alone. These are clearly new emergent properties of water when it exists in sufficiently large aggregation. This is where the concept of emergence comes into play in our analysis of our experiments in decomposition and recomposition. Implicit in physicalism is often the assumption of time reversibility. This is the idea that the result of an interaction creating a new configuration of elements can be fully reversed by ‘playing the causal process backwards in time’ to return the process to its original process state and its elements to their original individual elemental states. Much of physics, especially its laws of mechanics, is based on this principle of mechanical reversibility. Where reversibility holds, and it always does, the reductionist argues, there is nothing truly ’emergent’ or fundamentally new at the material or causal level. In fact, the examples used by reductionists to defend time reversibility consist almost exclusively of aggregates of material object that are subject only to the laws of Newtonian mechanics, i.e. the laws of simple action and reaction to local impact and local rebound. Such cases may be ‘time-reversible’ since no atomic or molecular chemical reactions are taking place. For when chemical molecular or nuclear reactions take place, time-reversibility is impossible to demonstrate, for in such cases there is a real alteration of the material substances that does not reduce to mere mechanical action and reaction nor to mere mechanical rearrangement of isolatable parts. Beyond this, in its hardest and strictest form, materialist reductionism holds that all causality can be exhaustively and exclusively reduced to the mechanical motions of these particles and that therefore all causality points downward to and is exhausted by the causal principles exhibited by the dynamic subatomic particles constituting the entire universe. Again, reductionist doctrine holds that the direction of causal propagation is from the parts or the base substrate upward to the whole system or complex integrated aggregation, and that no higher-level, derivative or emergent layers of the system’s structure or ontology can have causal influences that propagate downward to the lower-levels including the substratum itself. The full meaning of this latter causal premise amounts to the assertion that there are no causal principles exhibited in nature beyond those of the ultrastructure’s particles and their classical (or in modern physics quantal or probabilistic) motions. Thus, strict reductionism denies that there are or ever can be causal laws that are independent of the laws of particles in motion including laws related to forces within and characteristic of the fields encompassing the system objects, particulate ontology. Standing against reductionism as the current dominant scientific approach to complexity, is the concept and doctrine of emergence. Emergence, begins with non-reductive physicalism, which is the assertion that the whole is more than the mere sum of its parts. By this is meant that the properties (including the dynamics and laws) of the whole are not manifest in its parts, but are instead new features of the aggregate complex being that emerge lawfully, without contradicting the laws of its constituents, are able to supervene the overall actions of the whole by imposing new downward acting laws constraining and integrating the actions of its constituents. Self-organization is the observable phenomenon, appearing in all of the sciences at different levels of hierarchical structure, of the spontaneous organization of a large group of morphologically similar and co-existent material substances into mutually cohesive and dynamic structures and associated processes exhibiting new, i.e. emergent, laws that are not found in or reducible to their constituent substratum. What is essential here is to realize that emergence helps us to understand not only consciousness and life but chemistry and physics as well. It is a universal perspective allowing us to look a complex phenomena from a new, non-reductive, and more importantly non-doctrinaire perspective of what is possible and what is actual in a given physical context. This is the concept of emergence used by Robert B. Laughlin and is the concept of emergence used throughout the bioperipatetic blog site. Thus, Emergence as used in this blog refers to the scientifically proven principle that most (if not all) of the laws governing entities at the level of physics, chemistry and biology “emerge through collective self-organization” (from A Different Universe: Reinventing Physics from the Bottom Down by R. B. Laughlin, Winner of the Nobel Prize in Physics, Basic Books, 2005, p. xi). Strict reductionism denies entirely the ontology of emergence theory, and holds that, at best, emergence is a mere abstraction from aggregate behavior, which remains essentially reducible to an aggregation of simple particle causality, and, at worst, an illusion that there is more present than the parts and their separate actions and associated laws. But emergence is not an abstraction nor an illusion experienced at the level of perceived and measured aggregate matter. It holds that aggregation itself may yield more than a set of mutually independent elements, each retaining it own causal nature and behavior. The more is the observed fact that very often aggregation in nature yields critical coherent organization and that that coherent organization yields new laws that are caused by the organizational emergent properties. The origin of the organization is itself a property of aggregate matter or substance itself, which under critical conditions becomes self-organizing to yield a higher-level ontological order of being for that form of existent or substance. This blog will explore the rich work done by scientists and philosophers focused on the applicability of emergence theory with respect to such broad topics as evolution, molecular biology, bioenergetics, psychobiology, cosmology, physics, chemistry, and biochemistry. The most important principle of emergent systems is that their emergent causal laws act downward through their many hierarchical layers. Their emergent laws are not reducible to the laws of their substrate (their lower level ontology at the next level down in their hierarchical order). Emergent phenomena are not merely the effects of lower level structures and their corresponding causal powers. On the contrary, emergent systems have the power to affect the lower-level order from which they emerge. This is a profound idea, for it can help us to understand, for example, the relationship between consciousness and the dynamic processes manifest in brain physiology. As Jeffrey Goldstein argues, it is their causal efficacy that are most important in understanding the ontological significance of emergent phenomena. One strategy that has been used to support the reality of the emergent level is to attach to it a causal efficacy. For example, the neuroscientist Roger Sperry (1986) argued that the mind emerges out of brain functioning, yet the mind has causal power in affecting the brain. — from Emergence as a Construct: History and Issues by Jeffrey Goldstein , p. 62. By [ontological emergence] we mean features of systems or wholes that possess causal capacities not reducible to any of the intrinsic causal capacities of the parts nor to any of the (reducible) relations between the parts. Emergent properties are properties of a system taken as a whole which exert a causal influence on the parts of the system consistent with, but distinct from, the causal capacities of the parts themselves. Ontological emergence therefore entails the failure of part-whole reductionism, as well as the failure of mereological supervenience. – from Silberstein, Michael and John McGeever (1999). “The Search for Ontological Emergence,” The Philosophical Quarterly, 49: 182-200, p. 182 [cited and quoted in Notes to Emergent Properties.]. In essence, emergence is said to supervene on lower-level foundational components of a system, thus rendering the emergent properties non-reducible to the properties (including the laws manifest by) those foundational components. That emergence actual exists, as a mater of fact and not just as an intellectual nominalist possibility, can be clearly shown in many biological systems. One important example is that of the reflex arc, the set of receptors, receptor (afferent) neurons, joined linearly with a corresponding set of effectors, effector (efferent) neurons, yielding a causal end-to-end stimulus-response phenomenon that is fully accounted for interns of these neuro-motor elements. Yet, the reflex-arc does not normally manifest itself in the normal neurally integrated whole of the living organism’s nervous system. Here we see the very same neurons (fully isolable as elements of their corresponding reflex circuit) being overridden (supervened) by higher-level, central controlling mechanisms, that enable subtle intricate orchestration of effectors in response to centralized integration and processing of multiple afferent patterns of stimulation. This is the main theme of Sir Charles S. Sherrington’s seminal work The Integrative Action of the Nervous System, London, Archibald Constable & CO., Ltd. 1906. So higher-level processes and structures can emerge from, or rather be layered upon, more primitive processes and structures. This is the law of hierarchical development of living organisms and their associated processes. But we cannot know, necessarily in every case how this layering (which we call emergence) takes place. We cannot necessary know the detailed mechanisms and processes involved nearly so well as we can come to know the resulting systems, their properties and their laws. What we cannot and must not do, however, is to allow science to set the standards for philosophy, especially for ontology. Rather it must be the other way round: ontology teaches us what kinds of principles of being and what categories of lawfulness can exist for a given class of substances. This is of course, Aristotelian. But today, the philosophy of science is dominated the ontology of the science of physics: all is matter (defined as atoms and their subatomic structure) and its mechanistic laws. According this the view, as we have see elsewhere in this blog) the universe is ultimately and fully reducible to the actions of atoms, for that is ‘all there is.’ For science to make progress in the biological, psychological and social sciences (where the physical sciences have their most serious limitations and are least able to penetrate or provide explanation and understanding), its ontology must be based on realism, not physicalism. Physicalism, at the base of modern physics, provides a biased and limited perspective on the ultimate nature of the universe. The philosophy of physics boldly, and arrogantly, dictates to the universe what it must consist of and how it must work. This attitude is neither philosophical nor, properly understood, scientific. It is in fact dogmatic. It reflects a dogma that goes back to Descartes and has never been challenged by modern science. For more on this topic, see Descartes and the Philosophical Crisis of Modern Science. Given Aristotle’s ontology of form as the final cause or ontological teleology (that for the sake of which) of an object’s actualization (through its formal principle or eidos) of its potentialities (through its material principle or hyle), emergence, these would be, in Aristotelian terms, foundations of actualization. Thus from an Aristotelian perspective, emergence can be regarded as a teleological intrinsic striving for an object’s final actualization through its formal cause. This hylomorphic application of teleology does not entail any sort of mentalism, consciousness or conscious goal-directedness. Rather it defines an internal relationship between an object’s form, matter, and final state as one inherently determined by the nature of the object and its substance potentialities for self-generation. One author, the biochemist Joseph S. Fruton, formerly Eugene Higgins professor emeritus of Biochemistry and Professor Emeritus of the History of Medicine at Yale University, argues for the valuable impact of Aristotle’s ideas regarding the primacy of form over matter and the concept of teleology (of final cause) on the science of physiology. More important, advances in the study of physiological processes such as the transmission of hereditary characters from parents to progeny or the transformation of a fertilized egg into an adult organism led to an emphasis on “organicism,” with a denial of the possibility that the properties of the whole could be explained in terms of the properties of its parts. This view has an honorable heritage, for Aristotle had written that “the formal nature is of greater importance than the material nature,” and that the proper method of studying a physiological process is to determine its purpose. For example, he stated that “in dealing with respiration, we must show that it takes place for such or such a final object, and we must also show that this or that part of the process is necessitated by this or that stage of it.” [Aristotle, De Partibus Animalium, 640b, 642a.] This teleological or, in its recent formulation, “teleonomic” view of the functions of the parts of a living organism is a ruminant feature of present-day thought among biologically minded biochemists who use chemical concepts and methods to study physiological processes. – Joseph S. Fruton, A Skeptical Biochemist, Chapter One: Biochemistry and Skepticism, Harvard University Press, 1992, pp. 2-3. Aristotle saw conscious beings, such as men and horses (his favorite examples) as substances whose matter (hyle) was the origin of their potentialities and whose form (eidos) was their essence and principle of actualization. For Aristotle, all beings are unified integrates of these two principles (hyle and eidos), neither of which can have actual existence without the other. Animals are thus, to Aristotle, essentially conscious beings. Man is essentially the rational being (reason being a more advanced, complex and sophisticated form of consciousness). Aristotle would probably not use the word emergent, but rather the word actualized to characterize consciousness as a realized power of certain forms of living animate beings. I believe that were Aristotle alive today, he would embrace a view of conscious beings, as instances of emergence of functionality through actualization of the organism’s potentiality for cognitive contact with its world, i.e. the ecological context in which it lives and unfolds. In his own time, before the age of scientific instruments of observation and measurement, Aristotle used his own natural acute powers of observation and reasoning to conceive living beings as substances (i.e., irreducible functional beings definitively capable of self-initiated and self-sustaining activity). Emergence is not an entirely new topic. Conceptual constructs resembling emergence can be found in western thought since the time of the ancient Greeks, and have at times had a significant impact on intellectual culture. However, emergence is emerging today as a construct of complex, dynamical systems. And what is exciting are the tremendous advances being made in understanding emergent phenomena. These advances are opening up the black box that had previously obscured the real process of emergence.– from Emergence as a Construct: History and Issues by Jeffrey Goldstein , p. 68. Emergence of a new level of organization from its lower level of organization implies that all of emergence is hierarchical. It is not all or nothing. It is not holistic versus atomic. Emergence is a continuous phenomenon in which higher levels or organization add new properties and laws to their lower level organizational basis. The emergence of high-level phenomena, such as life and consciousness does not occur as a single leap from inanimate to animate nor from non-conscious to conscious forms of being. The emergence of new laws from new organizational principles is hierarchical (as said) and, therefore, incremental and even quantal. However, this does not imply that the process is either continuous or gradual but may rather involve punctuated or quantal leaps from one hierarchical level to another. There are transitions between layers in all hierarchies that are sometimes ambiguous with respect to which layer they dominate and to which layer their laws belong. This should not be surprising given that all emergence is achieved by increasing discrete overriding of global control at the higher level where new global (relative to the lower level) laws dominate the behavior of the entity at that level of emergent unity. This does not imply the negation of the laws of the underlying or lower-level layers of complex organization, those laws remain , they simply do not dominate the manifestations of the organization at higher levels. In some cases we know that the higher level order channels its underlying infrastructure and lower level laws to yield new features, properties and laws. The process is not chaotic, in the sense of random or lawless, rather we are saying that each emergent layer is an integrated unified lawful level of organic organization. We are also extending Stephen Jay Gould’s 1972 concept of punctuated equilibrium to all levels of emergent hierarchical organization. The emergence of each hierarchical level of organization, it is asserted, represents a relatively sudden new level of organization and functionality that is manifest as a state of dynamic lawful equilibrium. What is essential to understand is that each of these levels or organizations and their related functional capacities are the product of emergence that is, for living organized substances (organisms) itself a concomitant of species evolution and elaboration, as well as (for sentient organisms) individual cognitive development. According to Koestler’s ‘Janus-Faced Holon’, at each level in an organism’s emergent hierarchy, the organism’s organization or structure at that level can be understood as having two aspects or ‘faces’, one looking up at its higher level or organization and one looking down at its lower level of organization. Arthur Koestler was (as far as I have found in the existing literature) the first to use this analogy of the double aspect perspective of hierarchical organization and behavior. He called this perspective the “Janus-faced holon.” A holon is Koestler’s word for a given integrated level in a hierarchy of multiple levels of organization, particularly clearly manifest in the organization of living organisms. Like Janus, the two-faced Roman god, holons have a dual tendency to behave as quasi-independent wholes, asserting their individualities, but at the same time as integrated parts of a larger wholes in the multileveled hierarchies of existence.
. . . Mr. Koestler shows that this polarity between the self-assertive and integrative tendencies is a universal characteristics of life. Order and stability can prevail only when the two tendencies are in equilibrium. – from the blurb of Janus: A Summing Up, by Arthur Koestler, Random House, 1978. Science begins by classifying different entities and substances (in the Aristotelian sense of substance), and then proceeds to attempt to discover their deeper nature and laws governing their nature. Ornithology, its principles and laws, emerged as a science independent of marine biology. Biology, its principles and laws, emerged as a science independent of the emergence of chemistry and chemistry, its principles and laws, emerged independent of physics. Astronomy and cosmology gathered facts about the celestial universe before and independent of the emergence of physics. This is natural, proper, and from the point of view of philosophy of science, scientifically valid. Consider the science of chemistry. Chemists discovered the laws of chemical interaction. And, through the exceedingly difficult processes of chemical purification and isolation, were able to discover the chemical elements, including the laws of their interactions and the principles underlying the groupings of chemical families that led to the slow yet powerful modeling of the periodic table of the elements. After the laws of chemistry were discovered, proven, codified and formalized, it was then possible to ask such questions as: ‘Are there underlying common physical principles and physical laws that can account for the known facts of chemistry?’ This is perfectly legitimate question, and its pursuit has resulted in a deeper understanding of chemical laws and their relationship to, and even, in some cases, their reducibility to physical laws. Now ask yourself: ‘Would the laws of chemistry emerge from the science of physics without the prior development of the science of chemistry?’ I for one am convinced that the answer is ‘No.’ The same verdict applies to bacteriology relative to chemistry, and of immunology and epidemiology relative to bacteriology . And so for biology relative to organic chemistry. Finally, we must add the science of psychology relative to biology. So the interdependencies are hierarchical but at each level of science from physics to psychology, there are unique phenomena and their associated laws that must first be identified, defined, studied and codified before any scientific body of facts at that level can be analyzed in terms of reductive or emergent methodologies. There is no scientific contradiction, dualism, or conflict between the method of reductionist analysis and reductionistic explanation, on the one hand, and emergentist analysis and emergentist explanation on the other. The issue is simply whether or not a given substance, phenomenon or system can be best explained or understood (at its broadest as well as its deepest levels) using one, the other, or both of these scientific methodologies. The refusal by some hardened reductionists to accept emergence as a valid and valuable scientific principle and method for the scientific understanding of complex systems, is properly labeled ‘doctrinaire reductionism’. Such an irrational practice has done harm to the non-physical sciences in general. But it is the science of psychology, the science so important to man’s conscious life, the science that actually unifies the sciences and the humanities, that suffers most from the inappropriate application of doctrinaire reductionism, blocking and preventing the isolation and discovery of psychology’s own independent theories and laws, before attempting to reduce psychology to neurology and neurology to biochemistry, to chemistry, and finally to physics. Physicists look at the conscious phenomenon of vision and try to reduce it to optics, chemists try to reduce it to biochemistry, neurologist try to reduce it to neurophysiology…all before the true laws of vision and consciousness are fully and properly identified and codified. This sort of doctrinaire behavior is counter to the scientific spirit and can only slowdown, undercut, and possibly even destroy a developing science. Fortunately, emergence perspectives are far more supportive of the development of scientific theories about highly complex and deeply hierarchical systems. It is, in the opinion if bioperipatetic, emergence theory that will in the end enable and accelerate the proper development of the sciences of mind and consciousness. For a clear application of the positive value of emergence and the pernicious effects of doctrinaire reductionism with respect to the concepts of mind and consciousness, please peruse the bioperipatetic page entitled Emergence of Mind. This page is divided into two topics: A Mentalist Monist Emergence Theory of Mind (Sperry ²) and Mind and Brain: The Epistemological Battle (Efron ¹). A cautionary note: When perusing the literature on the subject of emergence (specifically emergent properties and laws), one frequently encounters articles that are strictly epistemological, which do not necessarily commit to any ontology of emergence, and other articles that are strongly ontological, which hold that emergence refers to a category of real properties, phenomena and laws existing in the physical world. The main issue here is that both epistemology and ontology are held either explicitly or implicitly as part of ones broader philosophy. So to say that a particular position is epistemological or ontological is not very informative unless one adds what philosophy, broadly stated, is held by the author. For example, is the author a realist, an idealist, a skeptic, a subjectivist, an objectivist, a nominalist, a conceptualist, etc. And what flavor or variant of these general schools of epistemology does the author embrace and apply to his/her interpretation of the theory and evidence for emergence? Unfortunately, reviews of the history and theories of emergence often mix or confuse the epistemological and ontological positions, and, unfortunately may apply their own ontological or epistemological prejudices to the interpretation of historical literature on the subject of emergence. We must be aware of this possible bias and, as far as possible, read the original work before reading (or drawing final conclusions from the writing of) critical analyses of that work. Of course this should go without saying. But in the case of emergence, an inherently profound and difficult subject, the analyses are often quite subtle and complex and the biases not at all obvious. For example, on the subject of the ontology of consciousness, two authors may both reject dualism, but that does not tell us where they stand. Are they both monists? Is one a monist and the other a pluralist? If so, what they agree upon and what they disagree about are both profoundly important. A monist regarding mind may be a physicalist monist and argue that consciousness is really only physical matter exhibiting processes that are fully reducible to the laws and properties of physics, and that the subjective phenomena associated with mind are either illusory or at best of no causal consequence (where causal means: physical cause of the Newtonian flavor). This is the most common, materialist reductionist, form of monism. It is rightly called physical substance monism. Another monist may be a panpsychist, arguing that all that exists is consciousness and all matter is a mental construct and therefore primarily dependent on consciousness for its existence (a mental substance monist) or that all entities are by their very nature both physical and mental at their base, and that intelligence is a necessary property of all entities. (See Leibniz or Spinoza for two sophisticated flavors of mind-body substance coherence or transcendence). A third monist may argue that consciousness is a real power of an organism. That consciousness is not a substance, but potentiality or power of the organism, that both of the above variants of monism represent doctrines that prevent us from properly grasping the nature of consciousness, and that mind is a naturally emergent (or actualized) mental phenomenon that is an organism’s necessary cognitive power for directly contacting the physical world (qua environment) and therefore a necessary emergent capacity to identify and guide the organism within the world (its environment) in its quest to flourish (i.e., to optimize its functioning) as a living being, for whom consciousness is a precondition for existing as that form of life. Beyond the work on emergence done in the physical and biological sciences, is the relevant and important work done in the application of emergence theory to human organizations and institutions, including the institutions of science, economics, law, engineering and, more broadly, the social order (Aristotle’s polis) itself. Since emergent phenomena are ubiquitous in organizations, the advances being made in the study of emergence can only have a huge impact on the study of organizational dynamics. Complexity theory, with its investigation into emergent phenomena, promises to provide both a methodology and a theoretical framework for studying something that is already playing a crucial function in our businesses and institutions. — from Emergence as a Construct: History and Issues by Jeffrey Goldstein , p. 68. We will investigate and discuss this work and try to integrate the implications for man’s understanding of himself, nature and society. Bioperipatetic believes that emergence theory will have a powerful future effect on philosophy itself, and perhaps lead to a new natural philosophy, uniting once again the sciences and the humanities into a uniform culture of knowledge, and resolving the unfortunate bifurcation of human thought and creativity into what C. P. Snow has called The Two Cultures. The most recent work directly related to the goals of bioperipatetic is the extensive research going on with regard to living systems at the Santa Fe Institute, in New Mexico. One important product of that research is the new initiative of attempting to define a meaning of the sacred that can be equally embraced by both science and the humanities. This program has culminated in a new book Reinventing the Sacred: A New View of Science, Reason and Religion, (2008) by Stewart A. Kauffman. NOTE: The important cultural significance of this book is noted, but is not fully endorsed by bioperipatetic. 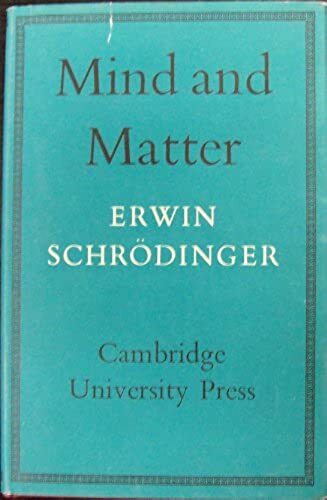 Erwin Schrödinger, ‘Mind and Matter’, Cambridge University Press, 1959. Shan Gao, ‘A quantum physical argument for panpsychism’, University of Sydney, Australia, philsci-archive.pitt.edu, 2013. Timothy OConnor et al., Emergent Properties by in Stanford Encyclopedia of Philosophy, 2012, and the related page: Notes to Emergent Properties. The middle way’ by R. B. Laughlin, David Pines, Joerg Schmalian, Branko P. Stojkovic ́􏰀, and Peter Wolynes, October, 1999. A. Sengupta, Adventures Beyond Reductionism: The Remarkable Unfolding of Complex Holism: Sustainability Science, October, 2012. Robert B. Laughlin, Winner of the Nobel Prize in Physics, A Different Universe: Reinventing Physics from the Bottom Down, 2005, Basic Books. Jeffrey Goldstein, Emergence as a Construct: History and Issues in Emergence Volume 1, Issue 1. Also published on Emergence: Complexity & Organization as: Emergence as a construct: History and Issues, March 31, 1999. Silberstein, Michael and John McGeever (1999). “The Search for Ontological Emergence,” The Philosophical Quarterly, 49: 182-200 [cited and quoted in Notes to Emergent Properties]. Sir Charles S. Sherrington, The Integrative Action of the Nervous System, London, Archibald Constable & CO., Ltd. 1906. Istvan Bodnar, Aristotle’s Natural Philosophy 2012, in Stanford Encyclopedia of Philosophy. Joseph S. Fruton, A Skeptical Biochemist, Chapter One: Biochemistry and Skepticism, Harvard University Press, 1992. C. P. Snow, The Two Cultures, a 1960 digitized version of the Rede Lecture 1959.